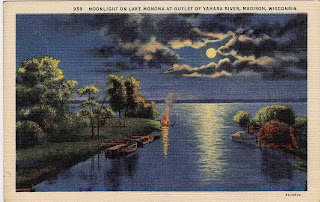 A great image of one of my favorite parts of the Yahara Lakes. Looking south from the Yahara channel out onto Lake Monona. At the opposite end of the channel, cutting across Madison's Isthmus, are the Tenney Locks. A fun trip to make by boat. This card was never mailed - no notes on the back.